French design is instinctive in France, a natural reflection of one's heritage and surroundings. Accepting trendy French Country from non-French designers may or may not provide the look inherit to French homes. For Francophiles who admire French design, we have to study French design for its details if we want authentic French style in our homes. How to know if something is French in design can be found by studying photographs taken in France. Truly a picture is worth a thousand words and can offer real insight in French Country, both design and way of life. 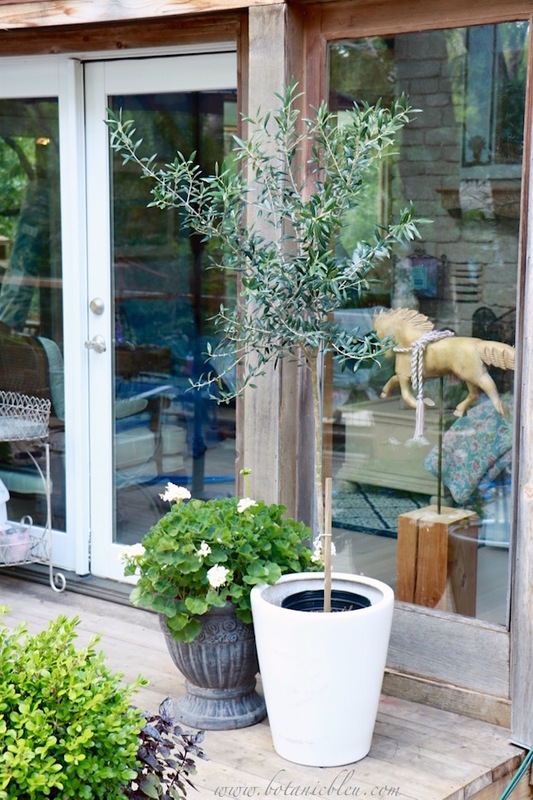 Take a look at how Parisians use olive tree topiaries in their city gardens for ideas on how to create a French-inspired garden in your home. Gardening in a big city like Paris can be challenging, but containers offer a solution for adding a touch of nature and green to city sidewalks, courtyards, and balconies. Key ingredients in Paris gardening are using hardy plants that 1] withstand harsh city environments of end-to-end paved surfaces and 2] thrive as a container plant. Olive tree topiaries withstand the brutal city environment and can last decades with pruning to maintain their shape and size. Both businesses and residents use olive trees in their container gardens. Small one gallon containers are readily available at Paris garden centers and fit small apartment balconies and living rooms. United States of America Customs laws prohibit travelers bringing live plants back into the country, or I would have figured out a way to bring one of these lush plants home as part of my carry-on luggage on the plane. Jardinerie du Quai is located in the heart of Paris in the 1st arrondisement on a street that faces the Seine River, just steps away from Rue de Rivoli. Tourists stroll past it daily, but Parisians shop there for flowers and shrubs to add to their gardens from the large selection shown outside the store. Inside, the garden center is filled with pots, tools, seeds, gloves, rain gauges, and fertilizer, much like American garden centers. If you are a gardener, visit the store for a glimpse into French gardening practices and possibly for a souvenir from France to use in your garden. 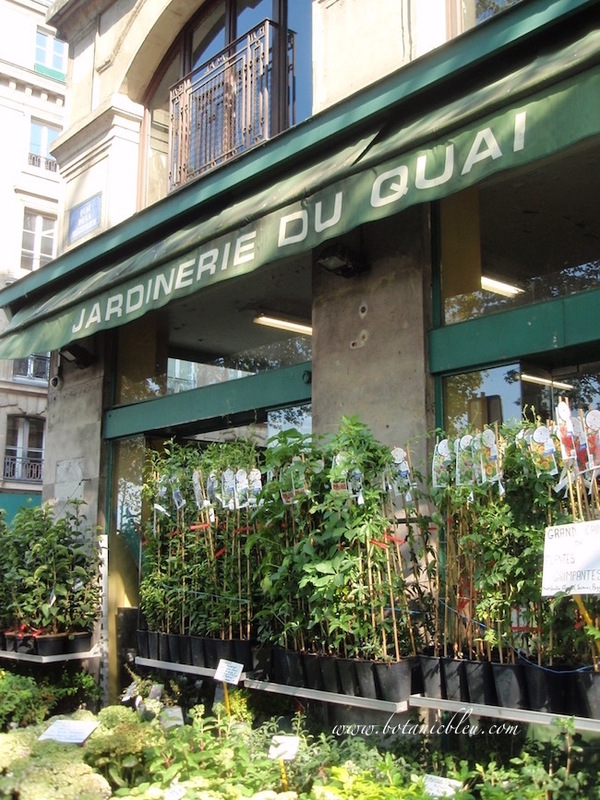 This is not a tourist store; this is where Parisians find their plants and gardening supplies. What better place to find genuine French garden design? 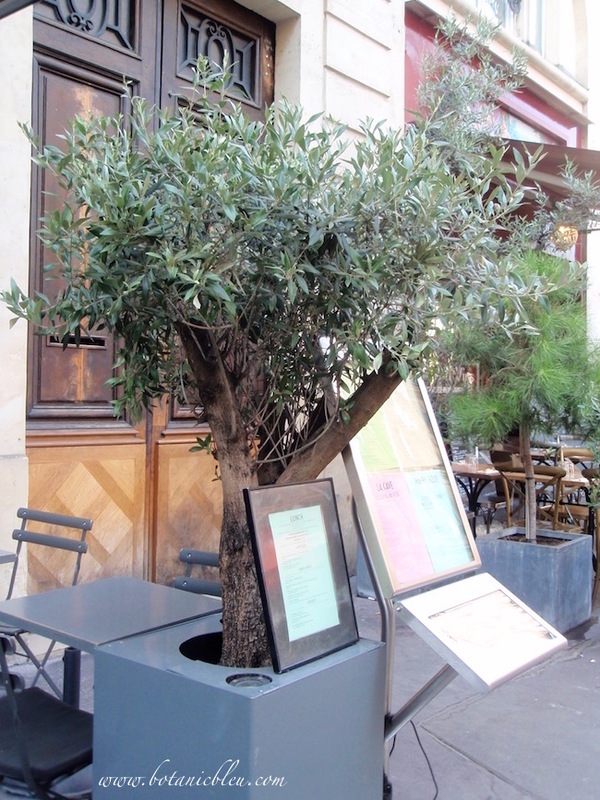 Over time, small olive tree plants can be transplanted to larger pots to grow into large trees outside Paris businesses like this one outside a restaurant. Pruning maintains the tree size. 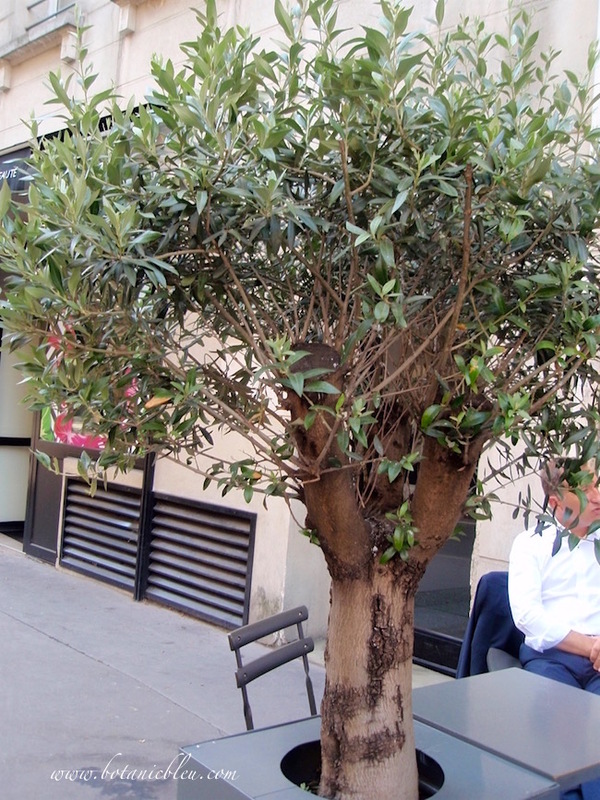 Potted olive tree topiaries are popular with sidewalk cafes. They add greenery without taking up much space, vital since space for tables is a premium. Menus are always displayed outside French restaurants so patrons can see the list of what's on the menu with prices to decide if they want to eat there. A close look reveals this tree had large branches that have been pruned severely, but the tree is thick with new growth that shows how hardy olive trees are. 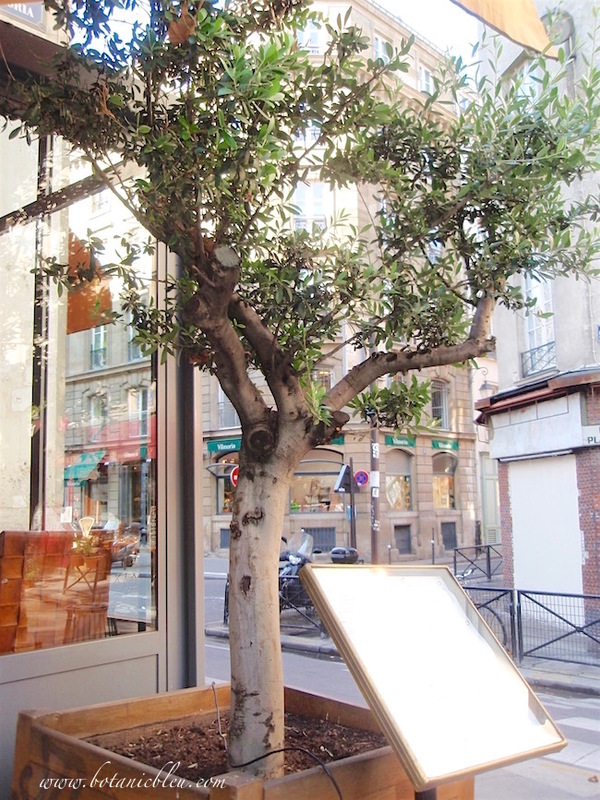 Seeing olive tree topiaries in Paris inspire us, my sister and me, to grow olive tree topiaries here at home. Fortunately, olive trees are not extremely hard to find in the United States. 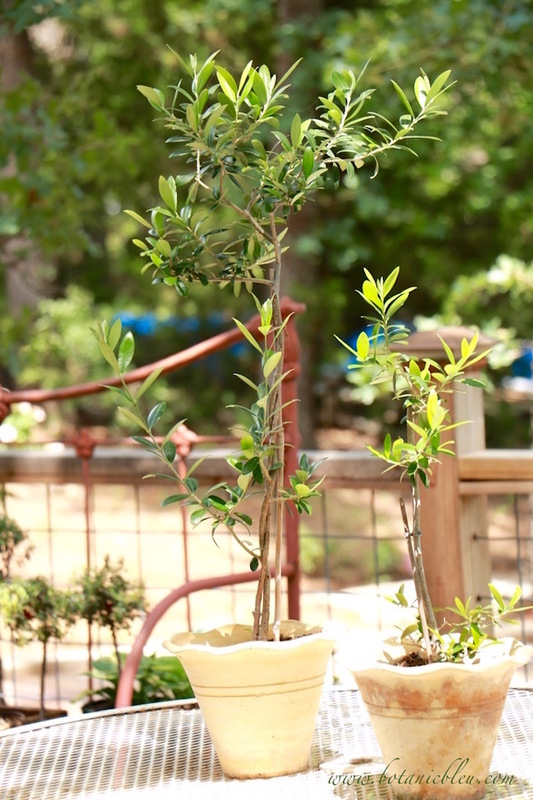 This spring, Walmart sold tall potted olive tree topiaries for about $40. This one adds a little French gardening design to our open deck off the living room. Small olive topiaries thrive outside in summer, but can over winter inside if placed near windows to get plenty of winter sunshine. The plant on the left has a braided trunk and is being grown to form a double ball topiary. The stems near the bottom will be pruned into a ball shape. 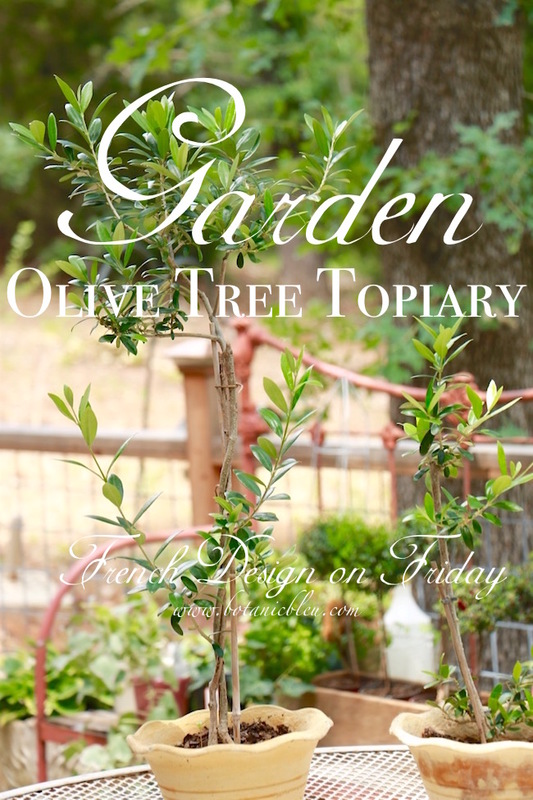 Are you thinking about adding an olive tree topiary to your French-inspired garden? Olive Tree Growers has a comprehensive article about The Care and Feeding of Olive Trees. Fast Growing Trees, Inc provides a growing map that shows in which zones (in the USA) olive trees can be grown outside in the ground year round and in which zones olive trees must be brought inside during winter. 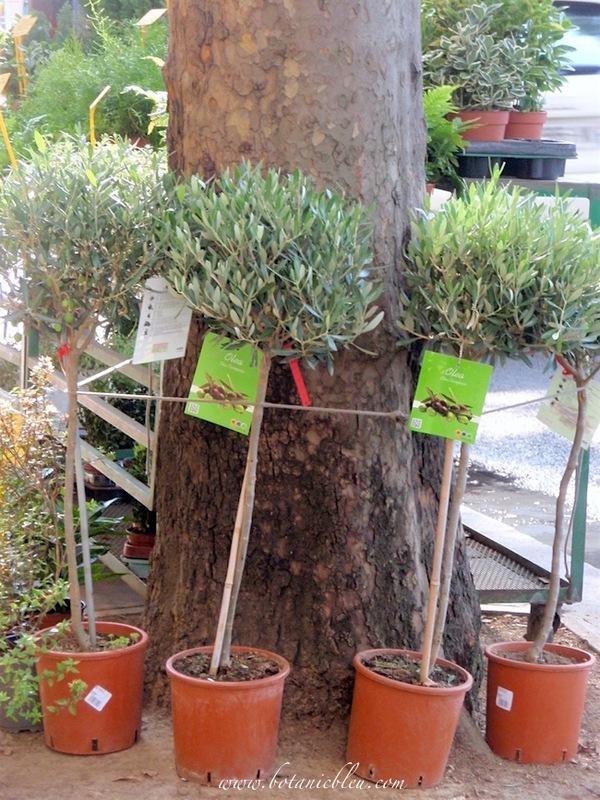 They also sell olive trees in several sizes. See Arbequina Olive Trees. Love topiaries of any kind? Pop over to see my Pinterest board Jardin Chateaux that includes topiary pins. Together we can create an authentic French Country home filled with French design in architecture, gardens, and furnishings. 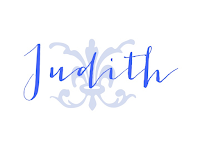 Judith, I loved your post today! I would love to have an Olive tree, and thank you for the links. Although I live in zone 6, apparently I CAN grow one (will have to bring it indoors for Winter months). Love your Pinterest board, too, so I'm following it! 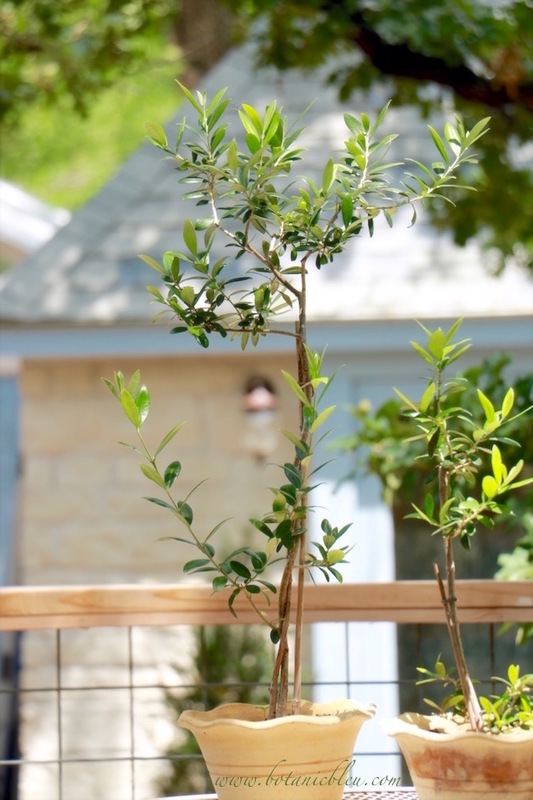 Your olive tree topiary looks perfect on your deck. I think there is such a feeling of almost elegance to potted topiaries. Thanks for sharing those gorgeous pictures! 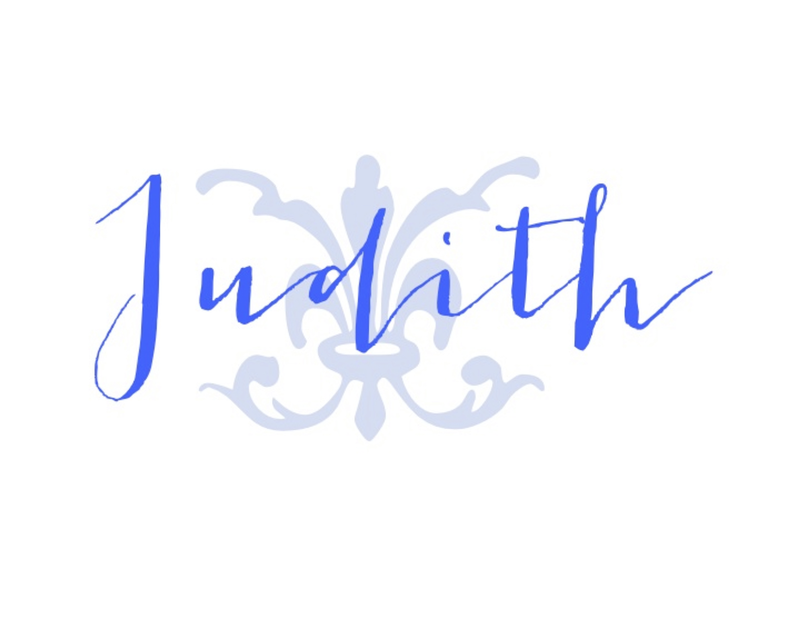 Thanks for sharing, Judith. I can't wait to see this for myself in September. I love your olive topiary. So pretty.